Fremantle defender Joel Hamling says Harley Bennell is a “future Brownlow medallist” if he sorts his issues out, declaring off-field habits held the key to better football on-field. Bennell returned to Fremantle training at Cockburn yesterday for the first time in eight weeks after the expiry of a club- imposed suspension for missing training following a nightclub scuffle in early January. Hamling made the extraordinary claim with the qualification that Bennell had to get himself right on and off the field and meet guidelines set by the club and players to earn trust. 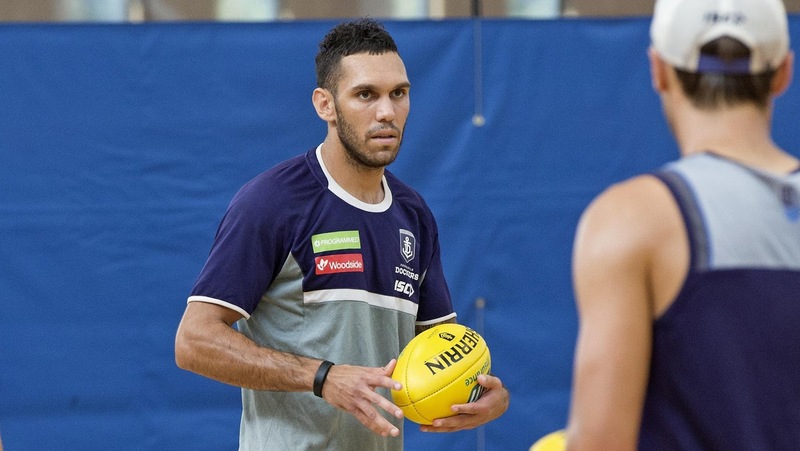 Bennell joined teammates for a skills session on the basketball courts at Cockburn Aquatic and Recreation Centre in the afternoon, but will not rejoin full training until club doctors are confident his suspect calves will stand the rigours of an AFL training program. Bennell sustained his most recent minor calf strain less than three weeks ago and it is likely the Dockers will run further scans on the injury to check on the rate of healing before stepping up his running program. He is unlikely to play at either Peel or in Fremantle’s final JLT Community Series game against West Coast this weekend. Stephen Hill (calf) is understood to be likely to play against the Eagles provided he gets through a training session today. Hamling labelled Bennell “bubbly and ready to go”. “He has had a good stint away from the club and he has worked really hard on his body and his preparation,” Hamling said. He said Bennell looked “pretty fit” and urged him to “put his head down and work hard”. “Obviously he has got guidelines to meet with the playing group,” Hamling said. “It is going to be hard for him, but he is a strong individual and a good character as well. “Harley is still only a young guy. He is 25. You have got to grow up really quickly in the AFL. He is still learning how to live a normal life. “In the AFL you get scrutinised a lot. You have got to make sure he is good and fine to go as a person as well. Fremantle leadership group member Bradley Hill promised support. “He knows who he’s close to. I’m one of those blokes he is quite close with, and I’ll be there to help him with anything he needs,” Hill told the club’s website.